project OCTOPATH TRAVELER is the latest game from the producers of the Bravely series, and it was first revealed during the Nintendo Switch Presentation 2017, back in January 2017. At the very beginning of the trailer, we can see a really detailed map of the Continent of Kingship, where the game takes place. 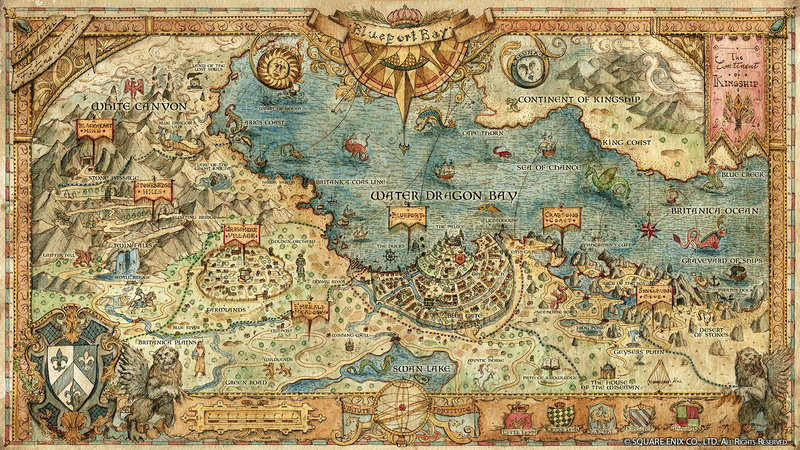 If you were hoping for a clean version of that map, you’re in luck: Francesca Baerald, the artist who created it for Square-Enix, shared it on the Cartographers’ Guild forum, last week. She made it using watercolour and ink on paper. In her message, Francesca Baerald explains that she also created the map of the demo, but unfortunately, Square-Enix is yet to give her the OK to share it online. But that’s not all: she also mentions a “full map”, that will be published once the full game is out (sometime in 2018). In other words, the map above isn’t the full map of the game, which certainly makes you wonder how big the world truly is! project OCTOPATH TRAVELER (Switch) comes out in 2018, worldwide. Thanks Exentryk for the heads up!